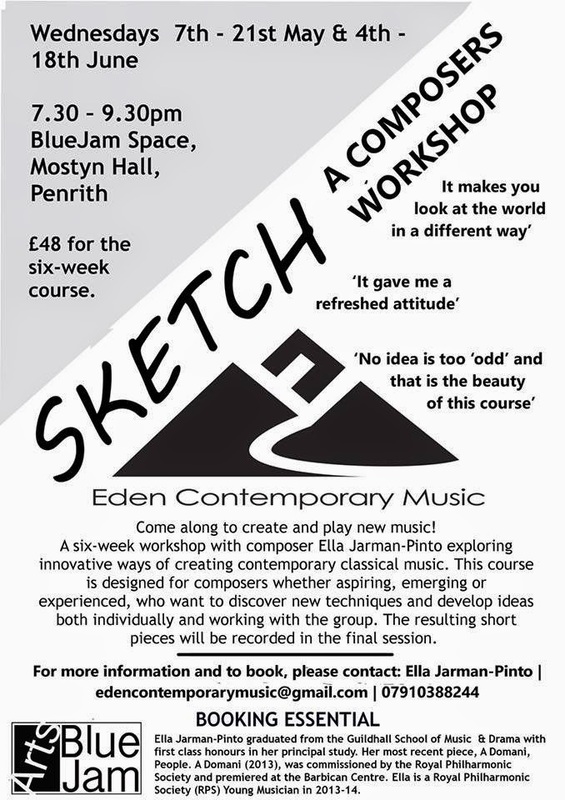 A six-week course in composition is running in Penrith during May and June, led by composer Ella Jarman-Pinto and in conjunction with BlueJam Arts. As you'll see in the poster above, sessions will last for 2 hours and take place on Wednesday evenings at the BlueJam Space in Penrith between 7th-21st May and 4th-18th June. The cost is £48 for the full six-week course. Sessions are open to composers of all levels who want to discover new techniques and develop ideas individually and within the group. The course will culminate with recordings made of the new pieces created. Composer Ella Jarman-Pinto is a graduate of the Guildhall School of Music and Drama and has recently moved back to Penrith from London. Her most recent piece was a commission from the Royal Philharmonic Society and was premiered at the Barbican. Booking is essential and interested parties are asked to contact Ella by emailing edencontemporarymusicATgmail.com (replacing AT with @) or by calling 07910388244.